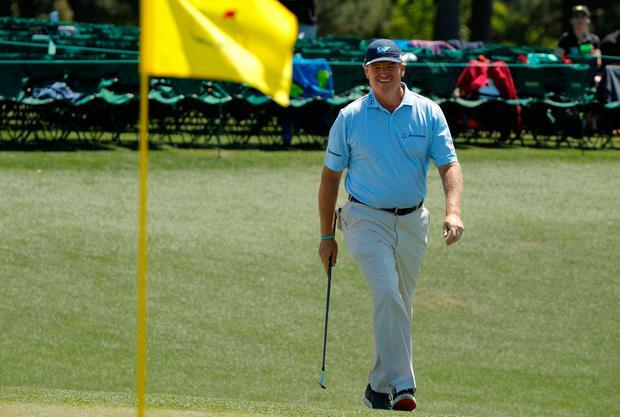 Ernie Els bowed out of the Masters after 23 appearances dating back to his debut at Augusta in 1994. The 'Big Easy' went quietly, too quietly for his own liking, but at the end he had to accept his fate after a final-round 78 for 20 over par and last place in the tournament. But typical of the man, he fronted up and spoke about his feelings on what looks like being his final participation in the Masters. Els had done the hard work on the tough, wind-lashed, chilly days of Thursday and Friday, scoring 72 and 75 where many had failed, but an ugly 83 in benign conditions on Saturday meant he was first out yesterday. His playing partner was Augusta National member Jeff Knox, who played as marker with Jason Day on Saturday and Els yesterday due to the uneven number of players - 53 - who made the cut. The 83 was Els' worst score in the 80 rounds he played in the Masters, leaving him with nothing but pride to play for yesterday. Even that took a beating, hence a low-key exit for the man who won two US Opens and two Open Championships, the last one in 2012. No tears were shed. Els' emotions ran more to disappointment at his performance than a melodramatic stroll down memory lane. "It was just nice to play. Obviously I didn't play good again, but it was nice to go around again. I don't really feel emotional, because of my play. If I played better, I think it would have been a different feeling." If he can win a PGA Tour event in the coming months or gets inside the top 50 in the world rankings, Els (pictured) would make a return next year. Otherwise he will not be on the list of invitees, and his career would end without a Masters on his golfing CV. "If I look back on the 23-24 years, how many professional golfers get the chance to play the Masters 23 times? Having a chance to win it a couple of times was special, and this tournament was just not for me," he said. "I've won a lot of events around the world and that's fine." He has not quite given up hope of finding a way to play the Masters again, saying: "I'm 48 this year. If I get back, great. It's not totally out of the picture, but if it is, it is." Reflecting on his memories, Els said his debut year in 1994 was "very, very special". That year, he was 24 playing the Masters. He finished on two under, and in June that year, Els won the US Open for the first time. "I played with Jose Maria (Olazabal) in the third round that year. He went on to win, so obviously that was a great year. "And then, the times I came close. I think '04 was a really special Sunday for myself. Just being here, it's such a special feeling. "The members I've met through the years are similar people, and they run an amazing event. "To have been a part of it for 23-24 years is special. It's a place where you dream to get to once or twice, and to do it for so long was great." Els might have enjoyed a better finish to his Augusta experience, but the back nine showed its teeth. He was the first player to suffer on that famous closing stretch of holes, but not the last on this Sunday finish to the 81st Masters. Els had two bogeys and two birdies on his outward run, turning in level par 36. A bogey five on the 10th need not have troubled him unduly, except that the birdies dried up and double-bogeys on the 13th and 14th were real card-wreckers. Another bogey on the par-three 16th put the final nail in the coffin and led to a 42 back-nine score. Els is too long in the game to let a bad score affect him unduly, albeit that this one happened at the Masters. "It was a good weekend, beautiful weather and nice to play four rounds," he said. Masters 2017: Sergio Garcia wins first major in thrilling play-off with Justin Rose.